Pictures and words are categorized alphabetically and can be customized in the settings by deleting some words and also adding your own. 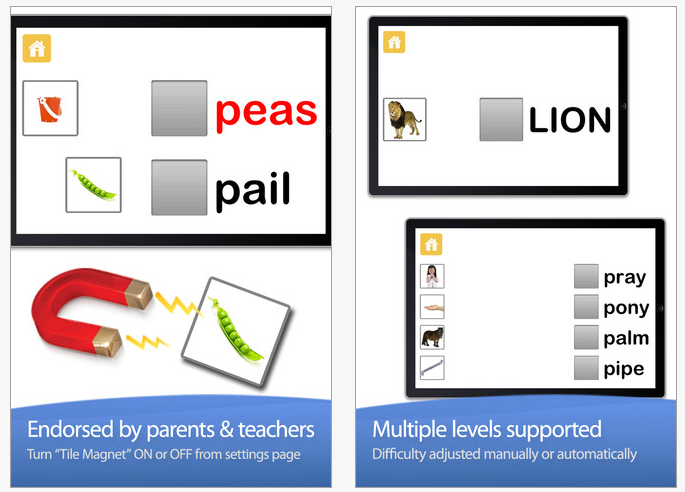 Little Reader offers a clean interface with real pictures that supports the needs of our special education students. I have a students who are working on functional life skills that this app could easily be used to make an activity featuring environmental signs, household, clothing, hygiene and grooming items geared to the needs of the student. When trialed creating a customized word list, the app accepted three and four letter words within the app. Add this and other Grasshopper apps as Little Speller, Little Patterns, Kids Puzzles as learning apps for your OT iTool Kit and share it with the teachers and therapists you work with! This entry was posted in App Reviews, Apps for OT's, Apps for Special Needs, iPad, Occupational Therapy, Pre-writing, Visual Motor. Bookmark the permalink.